Dude! How much to build one? That thing is sweet! OMG! I think I just jizzed my pants. I wish I could make one. If I did I would had use a Amtel chip with some kind of linux distro with a emulator installed. So I won’t have to destroy such a beastly peace of hardware like the N64. Dang, 3.5 hrs sounds pretty good. Did any of the other portable N64 builds get that much battery life? -and that video? Absolutely brilliant. Awesome hack and awesome presentation. Seen tons of N64 portables. Many much cleaner and smaller than this. This is what I’d call “average”, in the world of N64 Portables. Nonetheless, it’s still a fairly impressive thing. That sounds like a really nice little project for somebody. I’m not that much into gaming myself, but I can see where it would be nice for a lot of people. But from a technical aspect, it’s really nice. I haven’t seen the dirty details yet, but I think this has a future! I’m not sure what it is myself to be honest, but I’ve been tossing around doing some case mods or something like this and having done extensive auto-body repair I think light weight body filler aka bondo would work awesome in a project like this. It’s sandable, paintable, and decently sturdy. It wouldn’t really survive a hard drop however. I have also been tossing around the idea of using fiberglass and resin, now that would be a tough and nice filler material. Is it just me or does it look like there’s a tad bit of lag between the controller input and the video display? Nice you could make money of those. Didn’t realize it was possible to chop down the n64 board that much. But this is a great portable and amazing for a first. What are your plans for the next one? 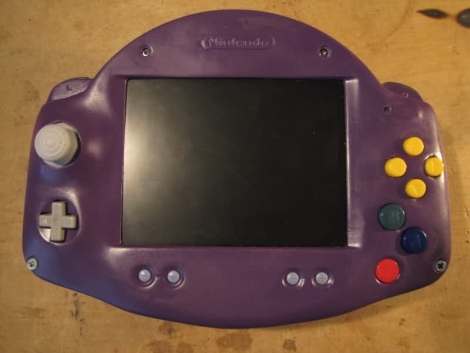 Also the originality of the gameboy advance makes me want this really bad and has inspired me to do something unique to my next portable! Anyone know where to get these PSOne LCD displays cheap? These seem to be a fixture in projects like these, mini arcade cabinets, etc. It would cost about 250$ to build a very nice looking one (such as this). It ultimately depends on what parts you are going for in terms of batteries, board revision, screen, smart charger, tact switches ect. Pretty fun hobby if you ask me although many sleepless nights of research is involved in making one yourself. I made a ps2 portable and since it was my first I spent almost 360$ on it. Most was the case but whatever parts makes you/ the buyer happy would be suitable. Guy’s a genius. No doubt about it. Well seems like a cool idea.